Colorado Gov. 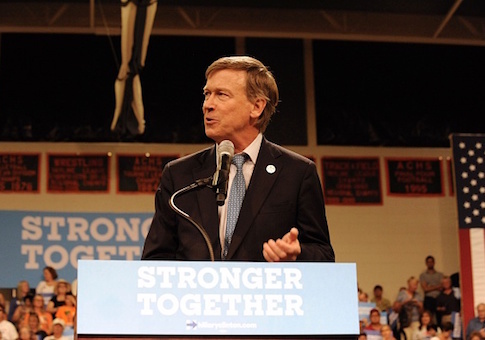 John Hickenlooper has created a leadership political action committee, a sign he is interested in exploring a 2020 presidential run and raising funds to pay for travel and other campaign-like expenses such as polling. The two-term Democrat will be out of office in January due to term limits. He has long been on media lists of potential presidential contenders, behind politicians with more national recognition such as Sens. Kamala Harris, Elizabeth Warren, and Bernie Sanders, as well as former vice president Joe Biden. Hickenlooper has so far demurred or sidestepped questions about whether he will run. In August he said he was talking with friends about the idea. His eight years as governor developed a resume of policy decisions and outcomes upsetting both liberals and conservatives. As a former geologist for a petroleum company, Hickenlooper was an ally of oil and gas as the fracking boom helped hold Colorado's economy steadier than the rest of the nation through the great recession, but the stance gave heartburn to environmental groups and the far left of the Democratic base. He signed new gun restrictions into law in 2013, including a 15-round limit on all new sales of gun magazines sold in the state. In the wake of that decision, a manufacturer of gun magazines and accessories moved their production out of state to Wyoming and Texas. Hickenlooper, 66, has twice said on the record that young, undocumented immigrants he encountered told him they cared little about a so-called "pathway to citizenship" and instead were primarily concerned with establishing some legal framework which would "get people out of living in the shadows." The first time he made those remarks in 2014, just after he had won reelection, earned him a quick rebuke from the Latino community. The Colorado Latino Forum issued a statement saying their group had "long underscored that access to a path to citizenship is a key value that must be included in any meaningful future comprehensive immigration reform package that Congress debates." He later tried to clarify to the Denver Post that "[w]hat I was saying was it's not their first priority. I wasn't talking about Latinos, I was talking about undocumented (immigrants)." But in the same interview, he added, "What I said in the interview, which didn't come out, is I have always believed in a pathway to citizenship." Hickenlooper repeated the idea two years later in a closed-door meeting with a civic group. In the first months of the Trump presidency, as Republicans worked on health care legislation, Hickenlooper became a frequent cable television guest alongside Republican governor John Kasich of Ohio, as the pair promoted their own "bipartisan" policy ideas. The appearances were so frequent it often fueled speculation that the two governors might create a dual-party "Kasich-Hickenlooper" presidential ticket, with political reporters calling it a "bromance." The Colorado Sun, which first reported the creation of the leadership PAC, said Hickenlooper's 2014 campaign manager Brad Komar would head the committee called, "Giddy Up." The Sun also reported Hickenlooper is scheduled to attend events for Stacy Abrams and Andrew Gillum, the Democratic nominees for governor in Georgia and Florida, respectively. This entry was posted in Politics and tagged 2020 Election, John Hickenlooper. Bookmark the permalink.